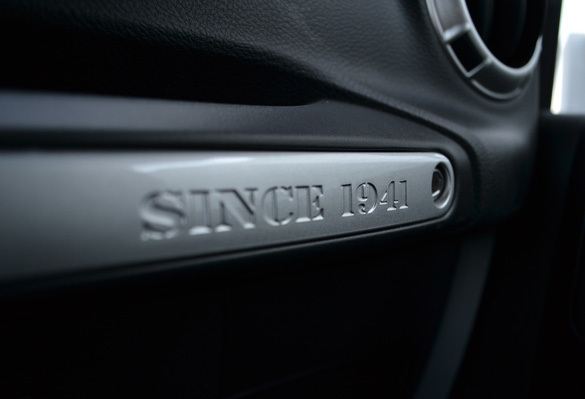 Jeep has been making its mark on this green earth for 70 years now. That mark can be found on some of the most treacherous terrain that you can throw at an off-road vehicle. 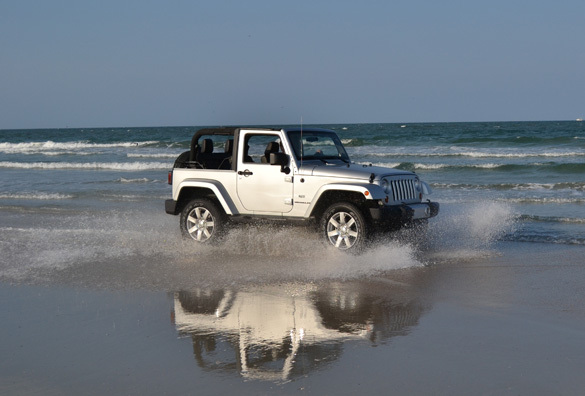 The Jeep is one of the most unmistakable and trusted off-road vehicles on the road since 1941. 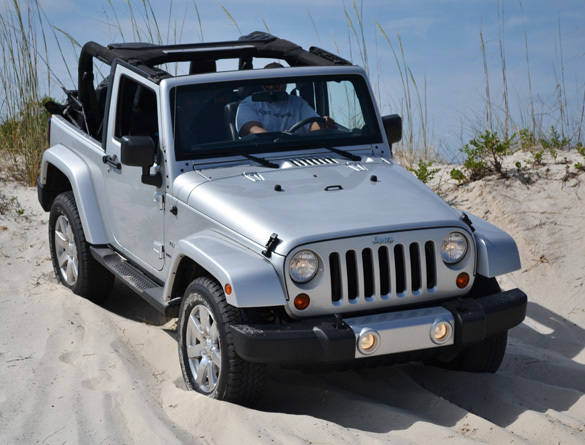 The Jeep Wrangler, introduced in 1987, continues to embody virtually the same characteristics that Jeeps were originally designed for, except in a modern-day package. 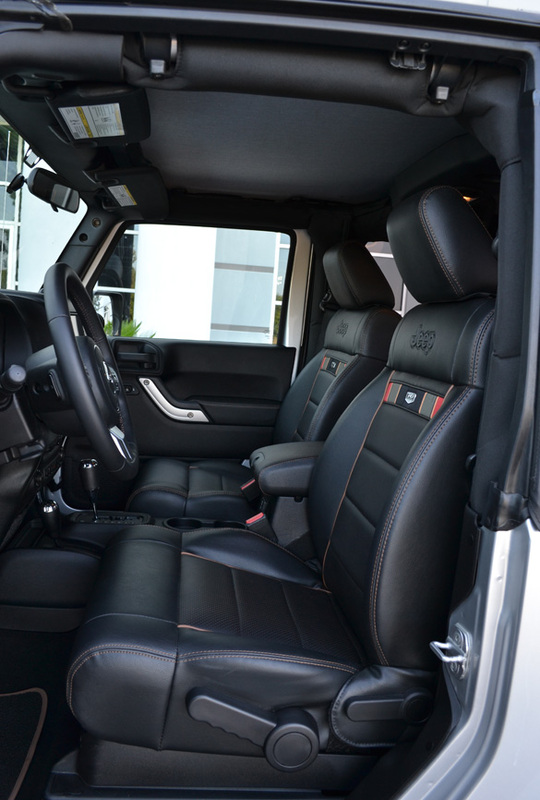 It may seem somewhat out of place to step inside of a new Jeep Wrangler and discover a dressed-up interior, but that is just what you will find in the new 2011 Jeep Wrangler 70th Anniversary Edition. I had the chance to test out the new Jeep Wrangler 70th Anniversary Edition on and off road and what an amazing experience it was. 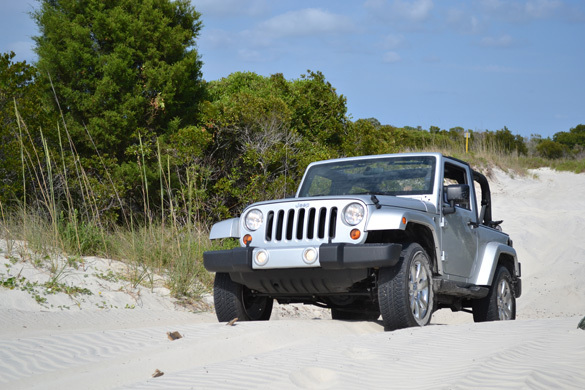 During my review last year of the 2010 Jeep Wrangler, it was no doubt how far Jeep has come in making their rugged off-roader even better. When it comes to changing things on a Jeep, enthusiasts will rarely accept big changes. That left the Chrysler corporation with the only option of sharpening their knife to carve out subtle changes that majority of Jeep-lovers would appreciate. I’m more than certain that is exactly what they have done for the 2011 model year. 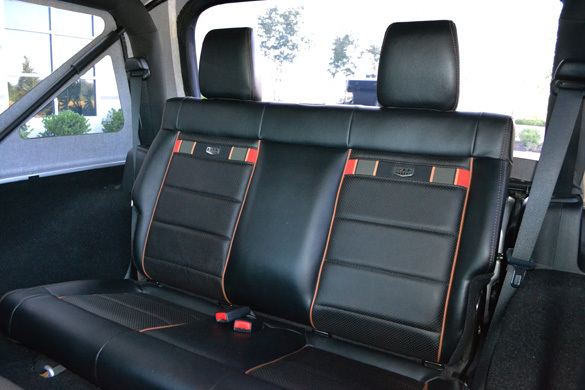 New for 2011 is a slightly revised interior in the Jeep Wrangler. 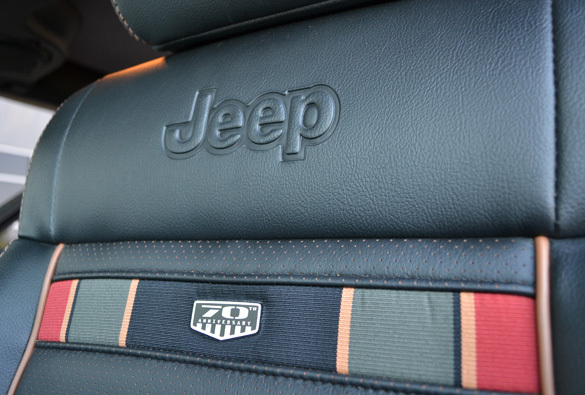 My 70th anniversary edition featuring leather seats embroidered with the 70th Anniversary logos. In the all-new interior you will find a revised dashboard layout, leather-wrapped steering wheel (borrowed from other 2011 model year Chrysler vehicles), an updated Uconnect GPS Nav touch-screen media center entertainment system, new instrument cluster, and revised shifter. I can honestly say the new Jeep’s interior is a big improvement and does not make the Wrangler feel any less capable when it comes to proudly wearing the Trail Rated 4×4 badge. 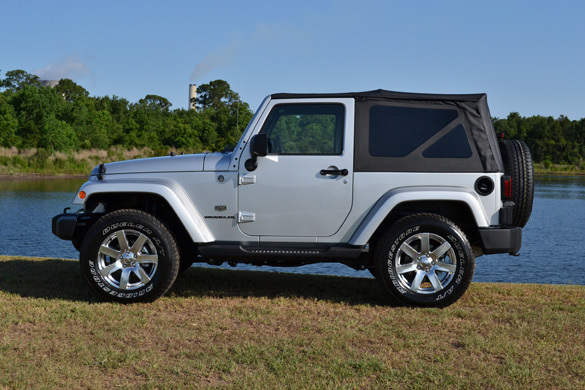 You do not find many changes on the outside of the new 2011 Wrangler with the exception of my 70th Anniversary Edition’s wheels. The new wheels are 18-inch 7-spoke polished aluminum wrapped in Bridgestone Dueler rubber. 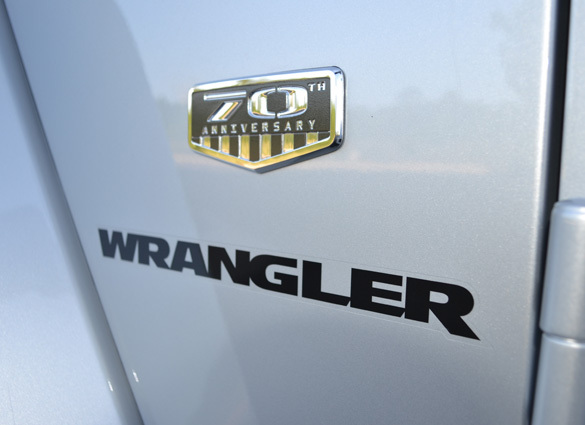 The 70th Anniversary Edition can only be distinguished from other Wranglers by its wheels and 70th Anniversary logo. 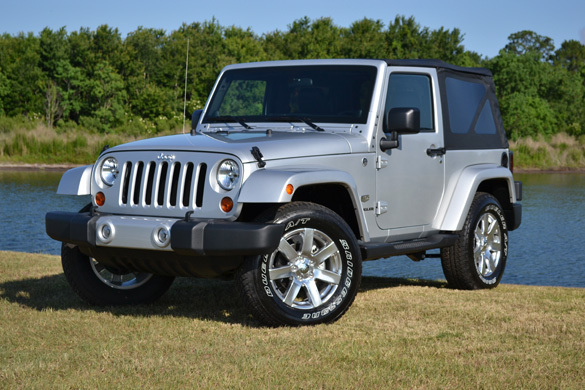 The 70th Anniversary Edition incorporates the same powertrain as a V6 Wrangler Sahara. 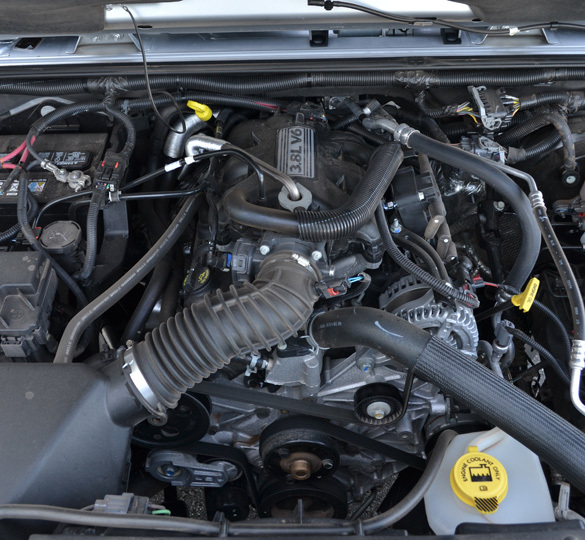 The 3.8-liter 202 horsepower V6 engine, now standard across the Wrangler line, is mated to a 4-speed automatic transmission. In customary fashion, the new Wrangler has an excellent 4×4 (part-time 4WD) system that proved to be a lifesaver during my sand dune excursions. 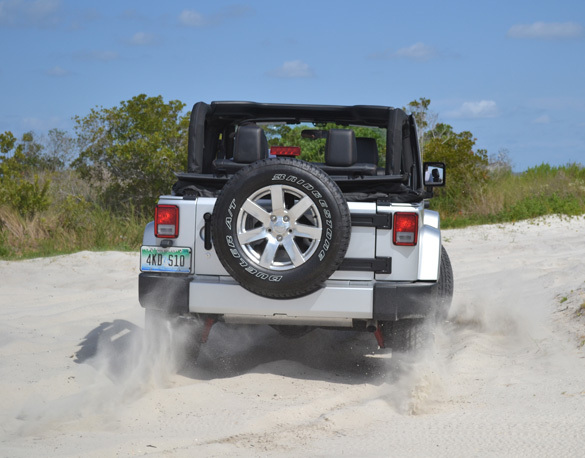 I took my Jeep Wrangler to the beach and then through some sandy trails with many steep inclines and drop-offs. 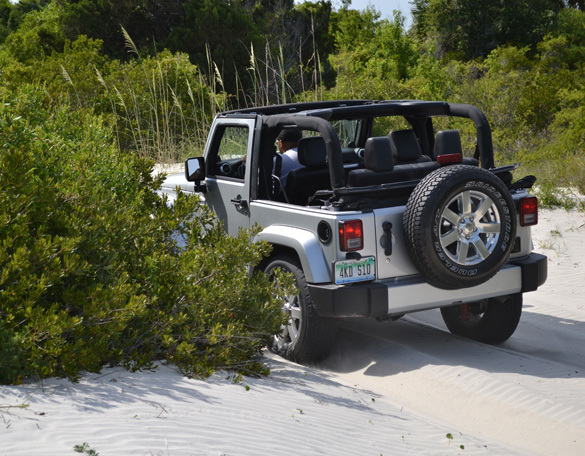 Initially I had some skepticism about taking the Jeep into deep sandy areas but after about 2 minutes in, my Jeep Wrangler proved to be reassuring and never failed me once on the trail. Hill Decent control works great but I did not find myself needing it much after my confidence in the feedback that 4-wheel-drive low gave me. On road, the new Jeep Wrangler is surprisingly competent and improved over previous generations. Of course with a 95-inch wheelbase you won’t get a ride anywhere near as nice as a Cadillac however; you can use the Wrangler for daily commute if you don’t mind the way it sharply turns in and high center of gravity. The high ground clearance, 10.3-inches, allows you to clear obstacles off-road but provides some instability on the highway. 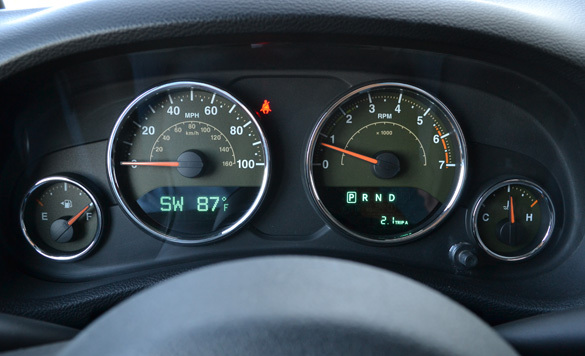 Braking distance is long and acceleration remains to be sluggish for the new Wrangler. On-road handling vs. off-road is almost a compromise that you must think-out when in the market for a serious off-road vehicle. Some would argue that the Jeep Wrangler is a purpose built vehicle even after 70 years of “improvements”. 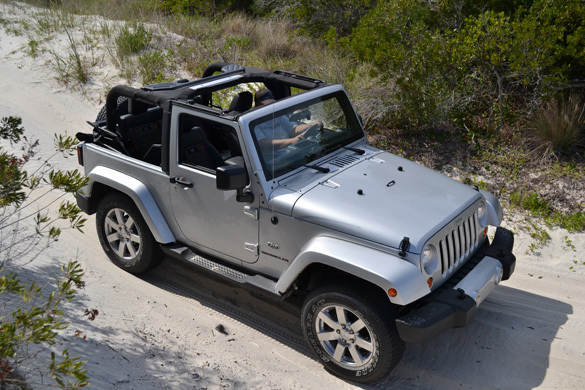 Sure, that can be said, but now with the 2011 model year’s changes, the new Jeep Wrangler aims for a larger audience that may have taken the Wranglers ruggedness as a turnoff. 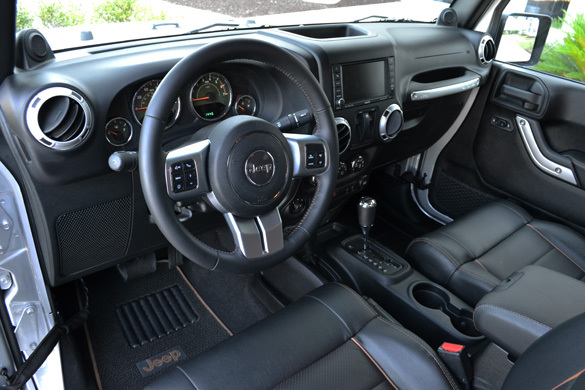 Still, the new Jeep Wrangler is just as capable as it has always been, but it has a few extra soft “edges” when it comes to the interior and creature comforts including polished wheels and heated leather seats found on my 70th Anniversary Edition test vehicle. 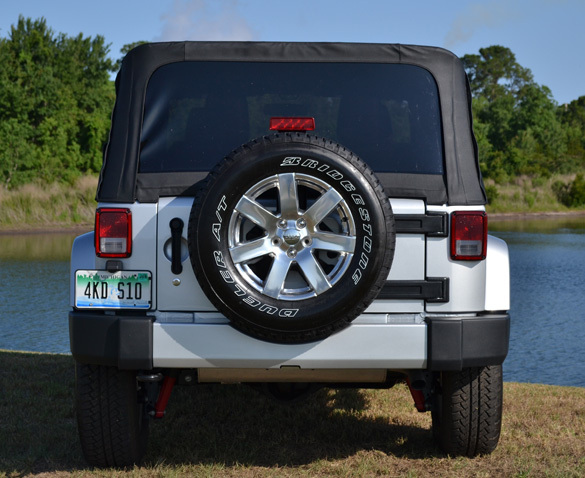 The soft zippered convertible top on my 70th Anniversary Edition Wrangler is difficult to remove if you have never removed a top on a Jeep. After a couple attempts, the top is easy to remove and even easier if you have an extra set of hands to help. 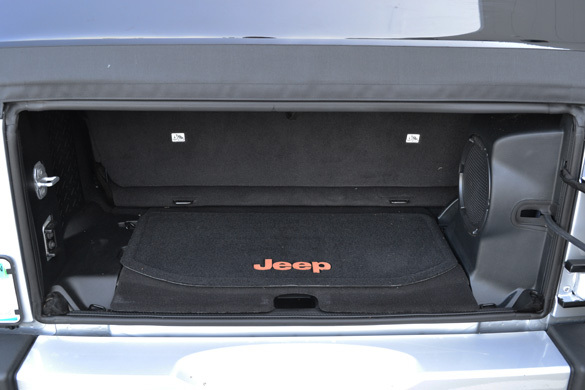 There is always a security issue with a zipped top, which is why Jeep has a locking center console in addition to the locking glove box. The doors can be removed and if you are crafty enough, you can remove the top bars in order to fold the front windshield down. 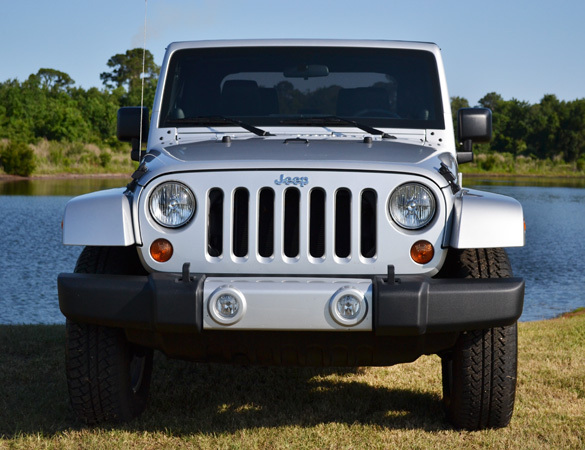 After 70 years in the making, it is good to see that Jeep has not lost its iconic American character in the Wrangler. 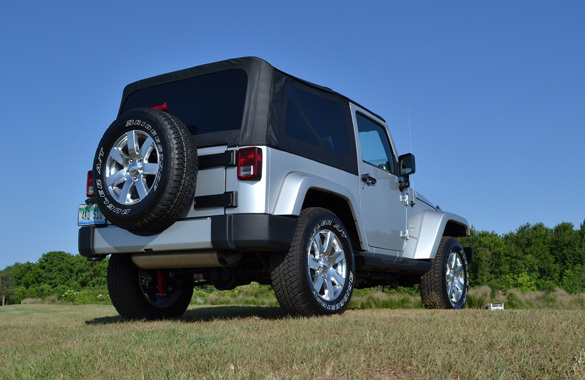 The 2011 Jeep Wrangler continues a long tradition of one of the most, if not the most, capable off-road vehicles to roll off of a factory assembly line. 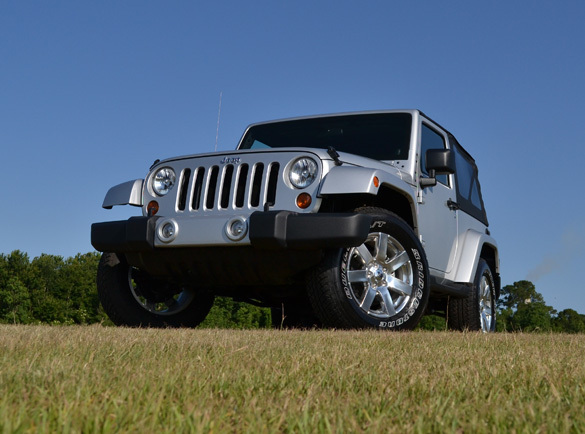 My 2011 Jeep Wrangler 70th Anniversary Edition had an as-tested price of $31,820 while you can get a base Wrangler Sport for only $22,045 with the same off-road capability. EPA cargo volume (seats in place): 17.2 cu.ft.